Staff spent the weekend constructing some raised garden beds. 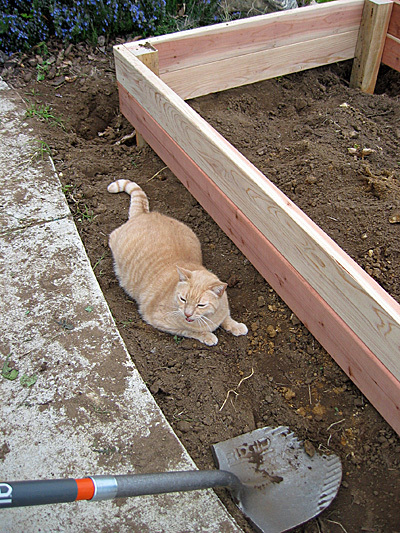 Jeff was especially interested in the holes dug to accommodate the posts of the bed frames. 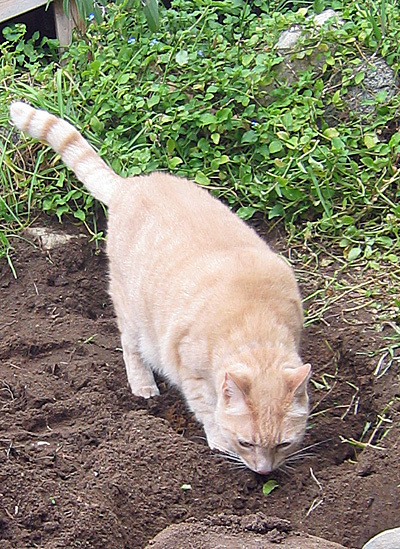 Though he watched Staff dig the holes, for some reason he is convinced that they are dens housing some hefty prey creatures. He darts from hole to hole, batting paws around trying to locate the imaginary creatures. Staff supposes the practice does not hurt. i never knew jeff had a green claw. Staff should allow Jeff to “fertilize” the garden with his “organic” material. Evil yearns for spring and is envious of Jeff. Why esle would you dig a hole if not to catch some nefarious subterranian creature? It is not the job of Staff to “suppose” anything concerning Jeff and his activities. 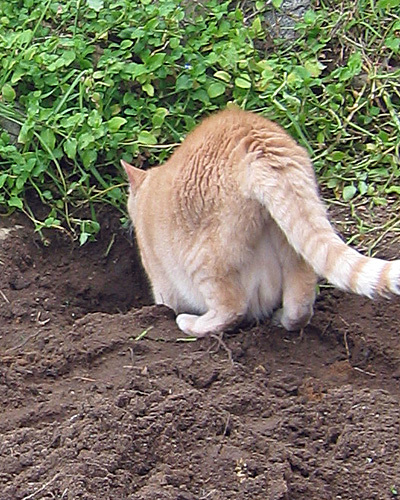 It is the job of Staff to dig more and better holes so that Jeff may be excited and entertained. Sharp mind, sharp claws-Jeff’s got ’em! A KING sized litter box ……. for a King sized cat!! Jeff was not chasing “imaginary creatures!” He was quite obviously showing Staff the many imperfections in the holes they labored over.